The tomatoes are late this year and the cabbages are copious. The pair of events is merged in my thinking because my primary use for spring cabbages is as part of the stock for tomato-based soups, meaning that I want tomatoes and cabbages at the same time and in proportion to each other. 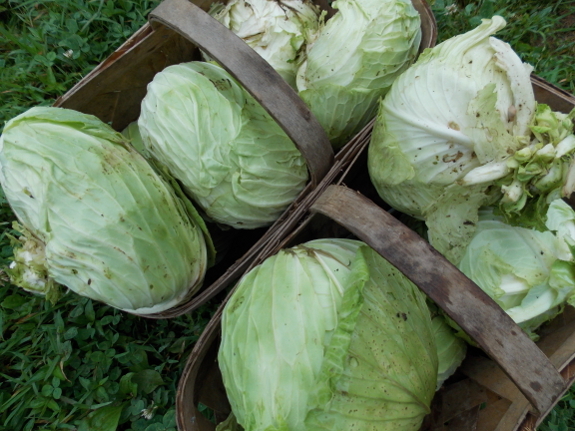 While we can definitely eat up some of the cabbages without tomatoes, I don't want to run out of cabbage during soup season. So this year I'm experimenting with time-lapse soup. What's time-lapse soup? It's simple --- I process each ingredient when it's on hand, freeze it, then thaw out various bits to compile into soup later. 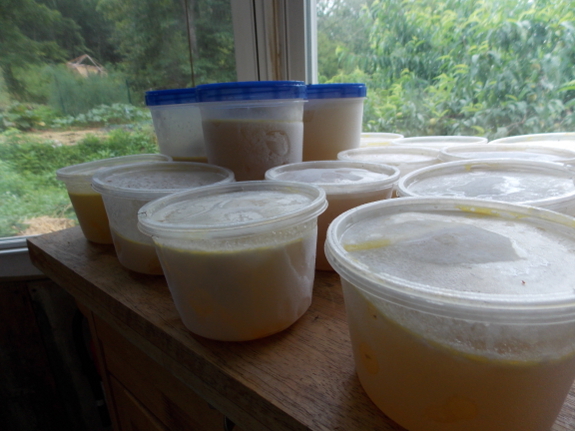 For example, I had more chicken carcasses this winter than I needed right away, so I made broth out of the bones and froze that. Now I'm thawing the chicken broth and using it with cabbages, potato onions, parsley, and the end of last year's garlic to make a denser stock. When the tomatoes come in, I'm thinking I'll just turn them into paste, then in the winter I'll thaw containers of paste, stock, green beans, and sweet corn, add in some carrots, and make my soup that way. The biggest flaw in this plan is that I froze the initial broth, thawed it, then froze it again with vegetables added. I had assumed that refreezing was forbidden, but the internet explained that the trouble with refreezing is that the freezer doesn't kill germs, just puts them on hold. So the germs can multiply during the thawing process, sit in the refrozen food, then multiply again during the second thaw, resulting in high microorganism populations and food that's a bit dicey. Luckily, the intermediate boiling step sets the clock back, so my refreezing shouldn't be a problem. The Avian Aqua Miser is Mark's invention that has brought clean water to thousands of backyard birds around the world. In my pursuit for the perfect tomato, I have amassed a collection of nearly 300 different varieties that I maintain seed for. Now collecting the seed is just a hobby. I have been trying for years to find a decent early tomato that isn't mealy and bland like most. This year I think I found a keeper. The variety is Sasha Altai from Irkutsk, Siberia. It is classified as a determinate, but I see it as more semi-determinate. I picked the first ripe tomato off at 47 days from transplant, and it was absolutely delicious, and had none of the negative characteristics of early tomatoes. It is listed as 55 DTM. It's pretty acidic on the bite, and sweetens out as you chew. We picked 60 pounds of them yesterday! Anyways, I saved seed from the tomato that ripened early, and would be happy to share a few with you to trial in your own garden, as I have become enthralled with swapping seeds since discovering the wonderful people of GardenwebI! One of the 'real' questions about keeping food, frozen or otherwise is, is it as good as fresh food. One of my MD friends said stored food is better! Yikes!! Clueless IMHO! My knee jerk reaction and probably yours is of course NO! Fresh food is always better. Why? I read one author who pointed out that most storage methods "denature" the food. By denature he meant the stored food was no longer able to come back to life. Many enzymes are modified in ways that modifies their behaviour, etc. I like this definition, but it does make meal preparation more difficult. I gotta eat what I have when I have it except for seeds. And the seeds need to be soaked [24 hours], sprouted or fermented to undo the phytic acid in them. For example, most whole wheat bread [ which has its wheat ground but never soaked ] is much more toxic than white bread. Why? There is more phytic acid trying to leach minerals out of me. So my take is, I need to eat most stuff fresh, well chewed and at least recently alive. Robert --- We'd love to try your favorite early tomato! We've been using Stupice, which is a trooper for us, but I'm always willing to see if something else is better. Please drop me an email at anna@kitenet.net and I'll send you my mailing address. In the meantime, any chance you'd want to write a short guest post summing up the results of your early tomato experiments? Daddy --- Usually, we do that. But it's been so rainy that our tomatoes aren't even changing color yet, and there's no room in the fridge for a dozen huge cabbages. I doubt they'd last at room temperature for more than a week or so. I buried cabbages once in Ohio--all winter with just the roots sticking up to find them. What about the underground fridge? Daddy --- The fridge root cellar seems to be hovering between 70 and 80 for summer temperatures --- way too warm for cabbage. The internet suggests that even a high-tech root cellar would be a stretch for keeping cabbage cool in the summer around here. Our average soil temperature is 60 degrees, but it varies by more than ten degrees between summer and winter, so I'm guessing 70 (or maybe 65?) is probably as low as you're going to get from sinking into the earth in the summer. Optimal cabbage storage temperatures are from 32 to 40 degrees. I suspect this is why the traditional method of storing spring cabbage is to lactoferment. I know this is not the best place for this but I did not know where else to place it. It appears you took down the blog about the deer. I just want to say, I thought it was an excellent spot and I can only think you received mail protesting it. If this is the case, it is too bad, because death is part of every person's life even if we do not like to think it so. I go on record as not being offended by what was presented in any way. In fact I was hoping to see how you processed your food and the steps taken. Keep up the good work. M --- We haven't taken down anything! I suspect you're referring to backyarddeer.com, which is still there, although we stopped updating it when our war on deer became much more sporadic. You'll also find several in-depth posts on this blog, specifically this lunchtime series talks about processing our 2011 deer.